The legal industry provides a steady and lucrative income for many professionals. The greater the compensation, the more education, and skill are generally required to perform the job and to secure the position. Here's a legal job compensation guideline to give some perimeters to average and typical pay scales per position. Keep in mind that exceptions exist in each job compensation category and that job compensation within any profession can vary—sometimes considerably—depending on geographic location, practice area, and experience level. The most highly compensated legal professionals are generally those with the most education and specialized knowledge. 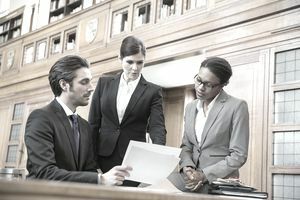 They're lawyers and judges, as well as those in high-ranking management positions such as litigation support directors and law firm administrators. Many consultants, including trial consultants, software consultants, jury consultants, and e-discovery specialists have also created lucrative solo businesses providing consulting services to the legal industry. That law degree might not automatically secure you a six-figure salary, however. The median salary for attorneys across all types of employment from associates in larger firms to solo practitioners is about $89,000 annually as of June 2017. But here's the impact of location: Those who practice in New York City can expect to start out at about $160,000 a year. Some lawyers in rural areas may earn less than $50,000 a year. You can expect to earn a bit more as a judge, but becoming a judge typically requires not only a law degree but also extensive years of experience in another legal position. The Chief Justice of the U.S. earns $263,300 as of 2017. When you think of it, that's only about $100,000 more than a practicing NYC attorney. Trial court judges earn about $136,000 annually. The majority of legal professionals earn between $30,000 and $100,000 a year. Experienced paralegals, legal secretaries, court reporters, magistrates, litigation support professionals, mediators, legal nurse consultants, contract administrators, and many courtroom personnel fall within this job compensation category. A certified paralegal in a metropolitan area who has some extensive experience can earn a median salary of almost $53,000 as of 2017. The range across all areas of practice, locations, and experience is from about $47,000 to $60,000. A good legal secretary with experience earns marginally less, particularly in smaller firms that aren't located in metropolitan hubs where job duties for the two positions often bleed together. Salaries of court personnel depend greatly on the geographical area. Entry-level legal positions and positions that require minimum training and skill fall in the lowest job compensation category. These positions include court messengers, file clerks, copy center professionals, mail room personnel, document coders, law clerks, and entry level legal secretaries. Law clerks are often law school grads who have not yet passed the bar or law school students who serve judges in an administrative capacity. They often take these positions as plum additions to their resumes and for the experience. In many areas, they serve one-year terms before moving on. For the most part, job compensation for other entry level positions will increase significantly as the employee gains more experience in the legal workforce.